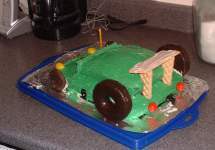 The headlights are malted milkball candies, the front bumper is a licorice Twizzler, the front wheels are chocolate covered cookies, the windshield is a Hershey’s bar, the antenna is a thin pretzel, the back wheels are chocolate covered doughnuts, the brake lights are cherry Dum-Dums with their handles sunk into the cake, the exhaust pipe is another Twizzler, and the spoiler is a frosted graham cracker supported by wafer cookies. I record it here for posterity, because the cake itself is already gone, down the gullets of a couple of dozen six-year-olds. I googled race car and this showed up thanks for the cute idea! Thanks for the specs. I'll make this one for my daughter's fifth. 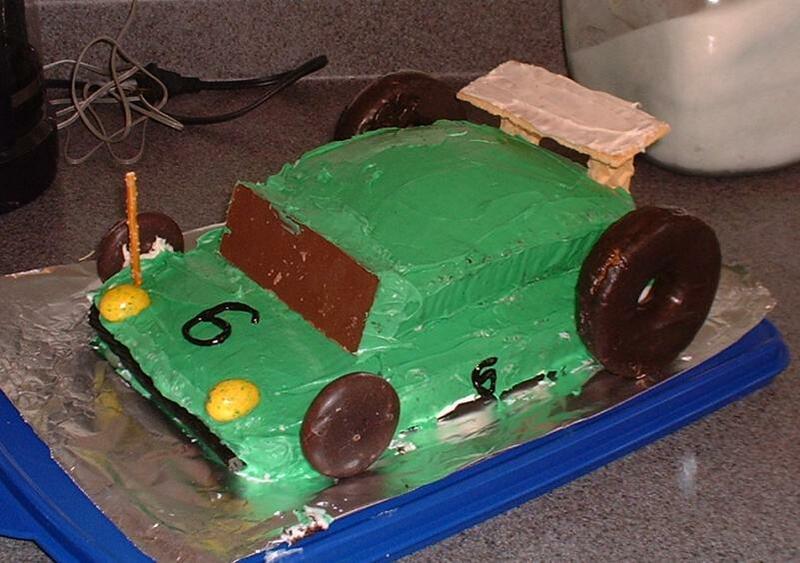 She wants a race car birthday. I am making a car birthday for my son, but saw your last name. Wondered if you had any origins in Wiscsonsin or Idaho because Batchelder isn't a common last name. We all lived in Idaho, but came from Wisconsin originally when we moved to this country.